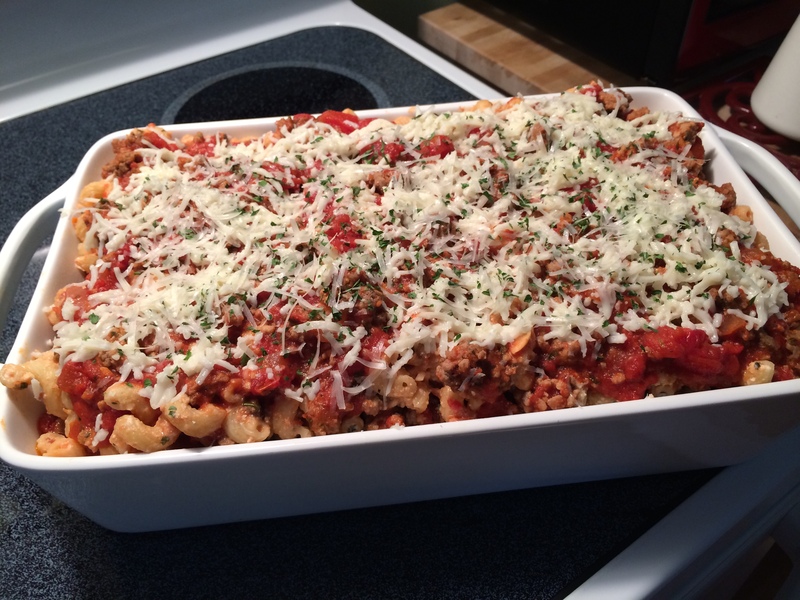 I think everyone loves a baked pasta dish. Maybe it’s because it brings us back to a childhood memory, a special event where everybody gathers together to celebrate something special. Whenever I mention the words”taste the love”, it really shows how much love I put into making my Baked Cavattapi. Now because there are a few different parts to this recipe that doesn’t mean it’s hard to do. You’ll see what I’m talking about moving forward. 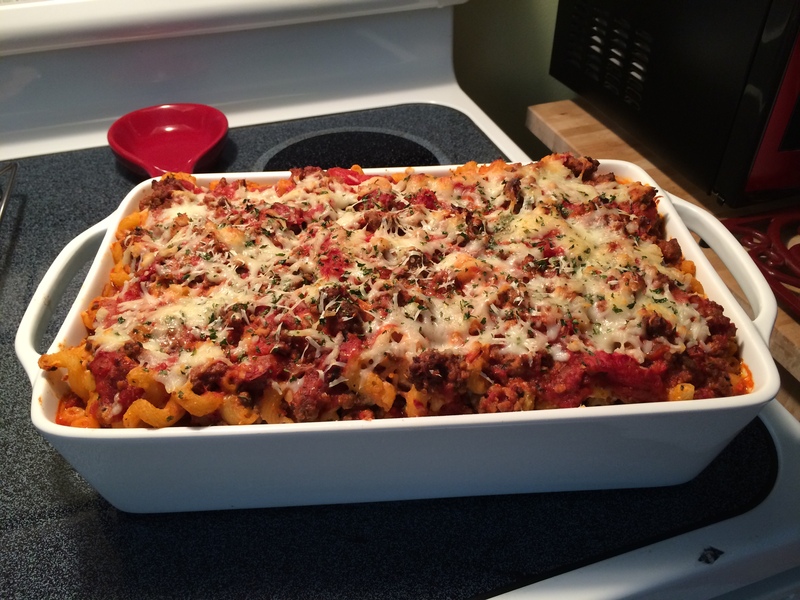 The great news is that this dish can be made in advance, or even frozen when stored properly. Are you feeling this? The whole house is smelling like my grandmother’s kitchen. In a 12-inch deep sautépan, on medium-high heat, add of olive oil and whole fennel seeds cook until fragrant, 1 to 2 minutes. 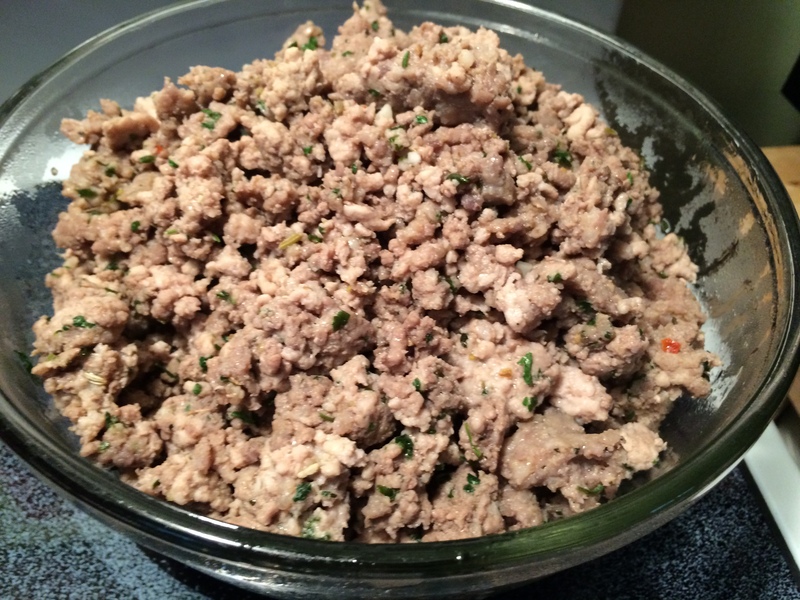 To the pan add both the ground pork and sweet Italian sausage. Using a wooden spoon break up all the meat. 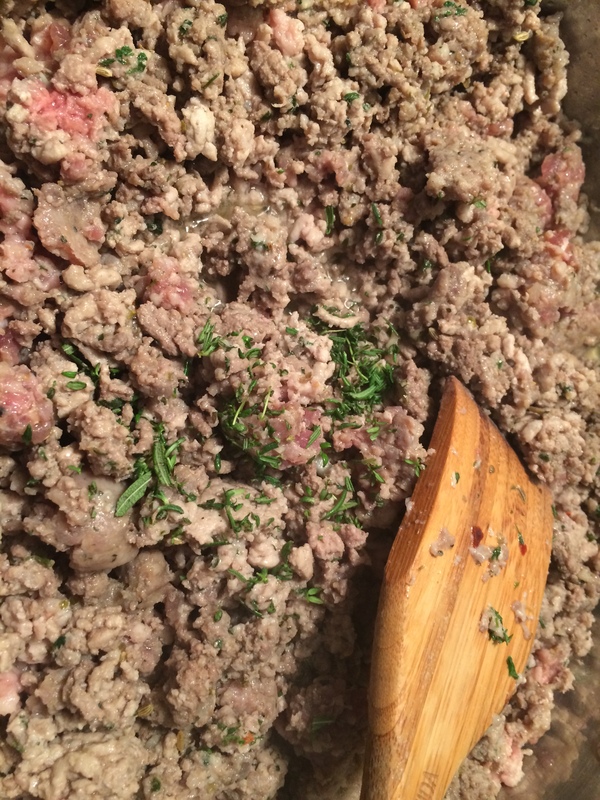 Add the minced garlic, dried oregano, Kosher salt, freshly ground black pepper and dried parsley flakes. 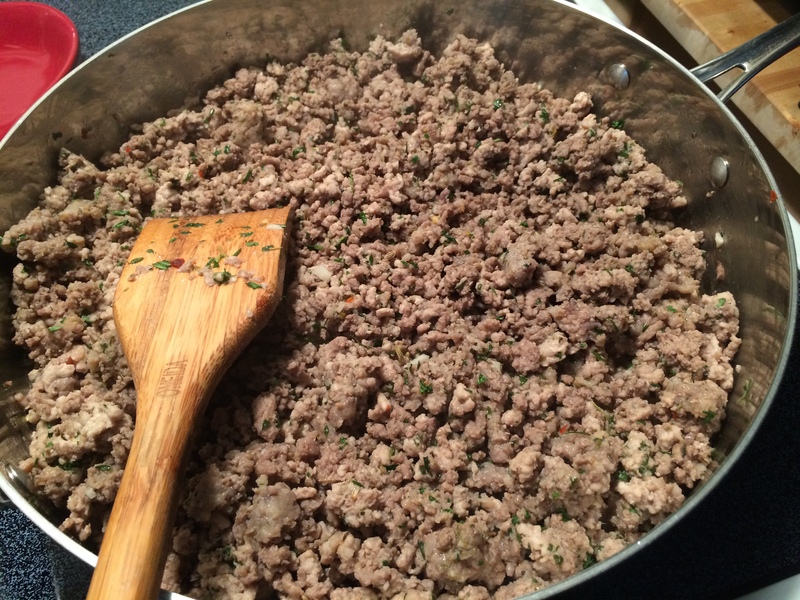 Sauté until the meat is completely browned, around 10 minutes Using a slotted spoon to strain off any excess grease, transfer the browned meat from the pan to a large mixing bowl, set aside. In a mini food processor, add roasted red peppers, in batches if need be, process until all the peppers are puréed and have a crushed tomato-like consistency. Transfer the processed peppers to a small bowl and set aside. Preheat a Dutch oven, on medium heat, add the olive oil. Next, add the diced red onions, Kosher salt, black pepper, crushed red pepper flakes, minced garlic, dried oregano, dried rosemary, tomato paste, and light brown sugar. Sauté for 2 to 3 minutes. Stir until onions are soft and translucent and spices are fragrant. Add the chicken broth. Simmer to reduce the broth by half. 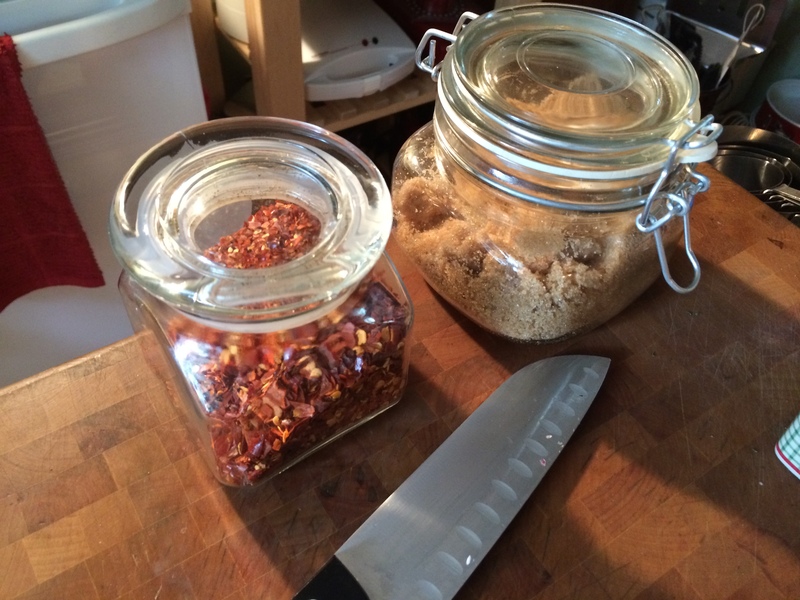 Finally, add both cans of tomatoes, breaking up the San Marzano whole tomatoes with the back of a wooden spoon. 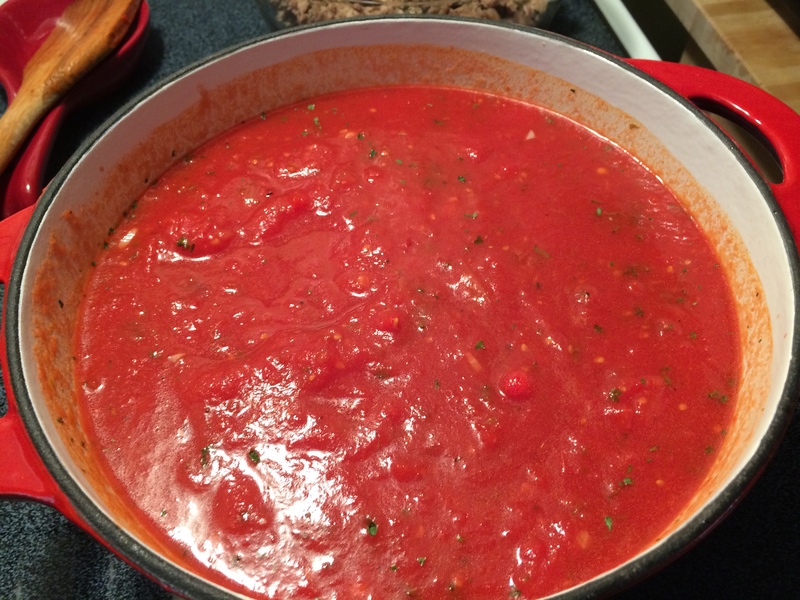 Simmer the sauce on low heat for around 25 minutes. 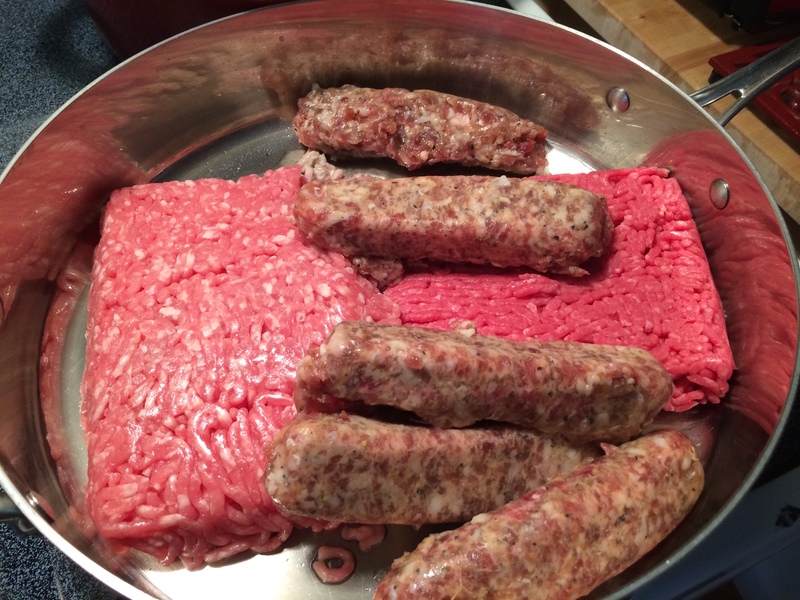 Add the browed meat to the sauce and allow to cook together for 1 hour more. 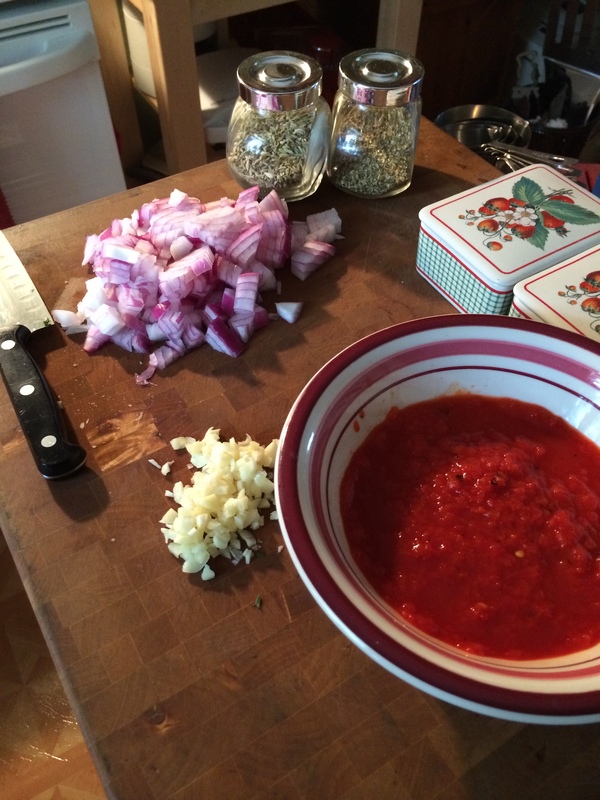 While the sauce is simmering start the pasta. Note: Undercook the pasta by 3 minutes according to the directions on the box. 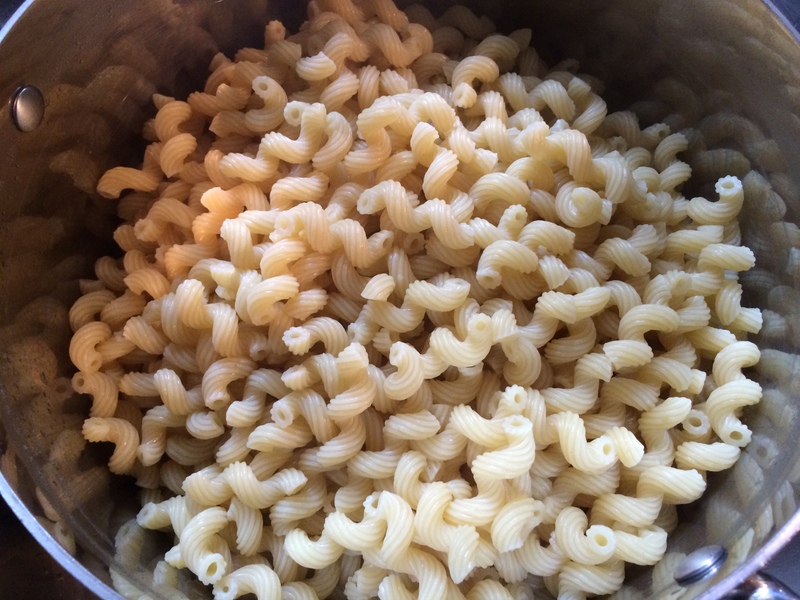 Pasta will continue to cook in the oven. In a large stockpot of boiling salted water add the pasta, stirring occasionally. Undercook the pasta by 3 minutes, then drain. 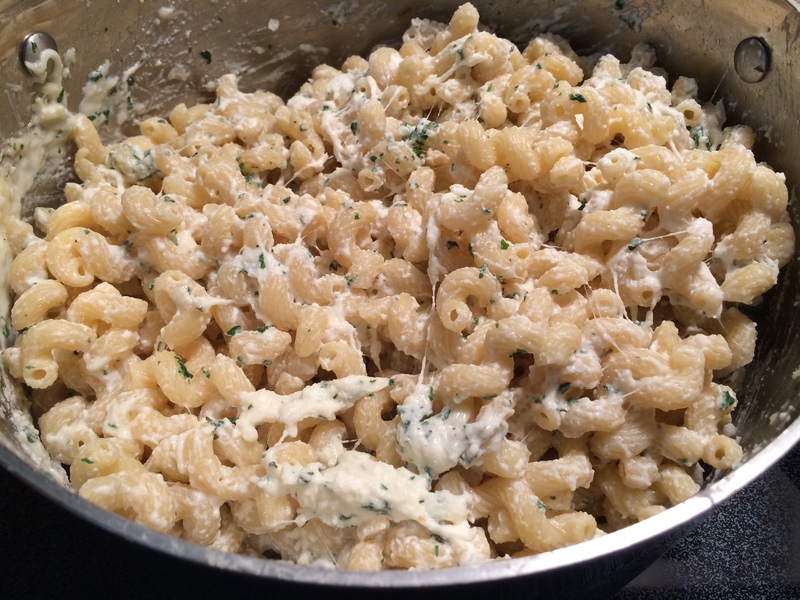 Using the same pot add back in the drained cooked pasta, Mascarpone cheese, Ricotta cheese, Mozzarella cheese, Parmigiano-Reggiano cheese, 1 1/2 ladles of the meat sauce, and chopped Italian parsley. Mix to combine. First, butter the baking dish. 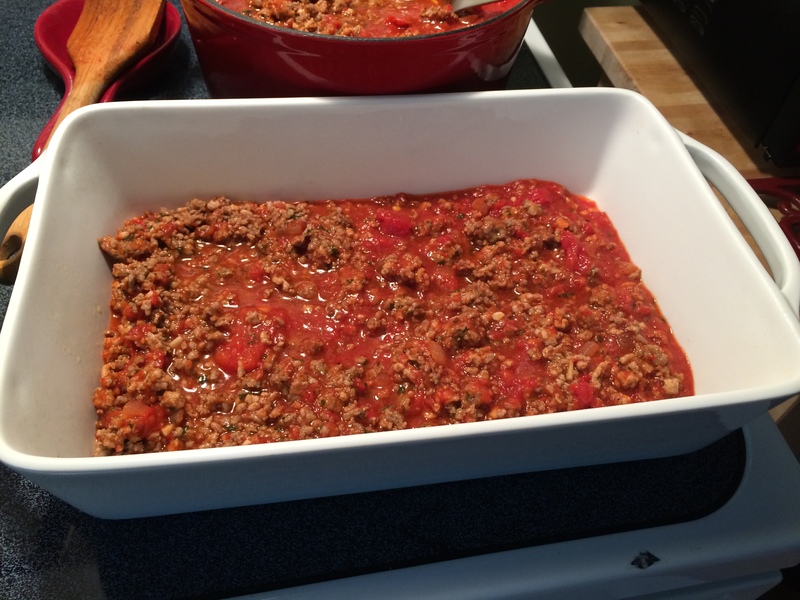 To assemble, add 1 ladle of the meat sauce to the bottom of the baking dish. Move the sauce around so it covers the bottom of the dish. 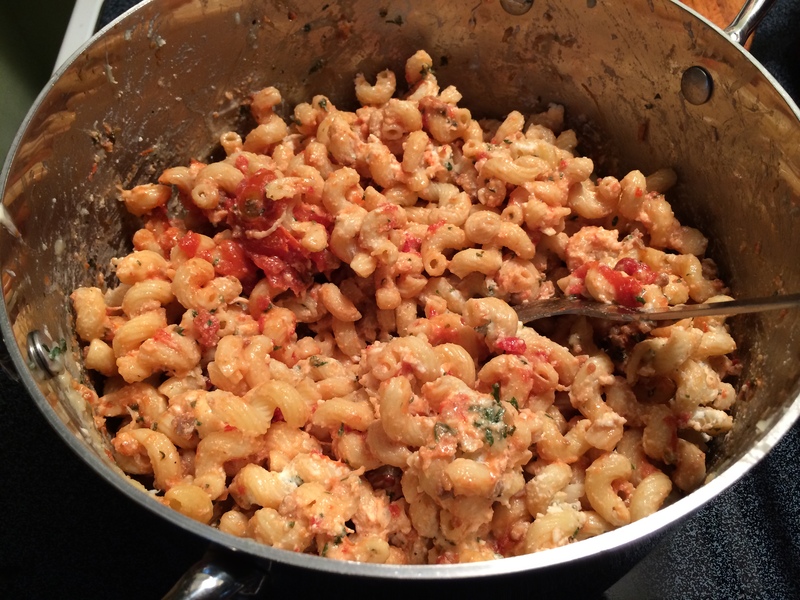 Add a layer of the half the pasta mixture. Top with half of the reserved Mozzarella and Parmigiano-Reggiano cheeses. 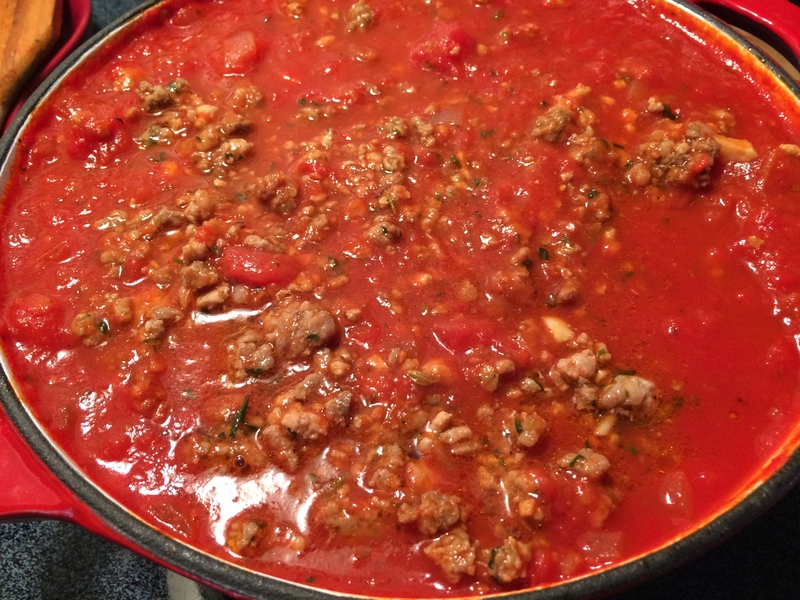 Next, add a third of the meat sauce mixture spreading the sauce evenly over the top of the pasta. Repeat. 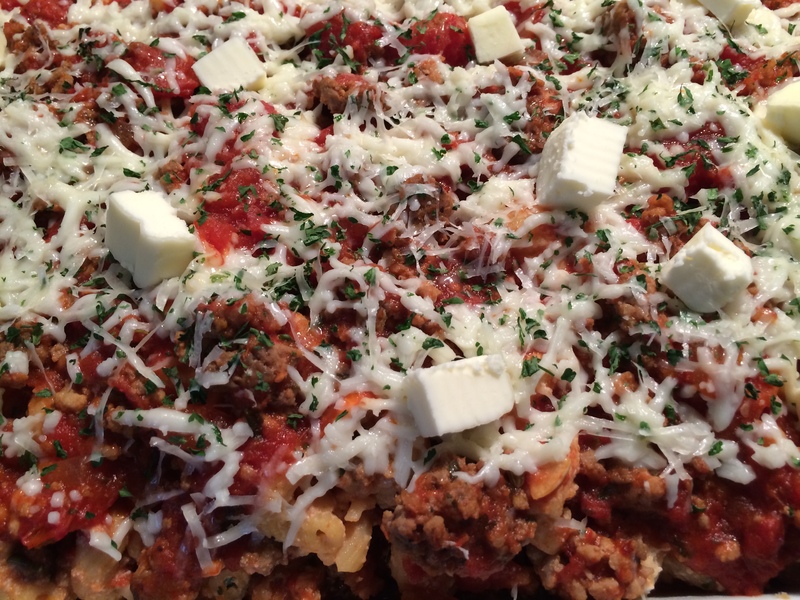 End with the meat sauce on top. 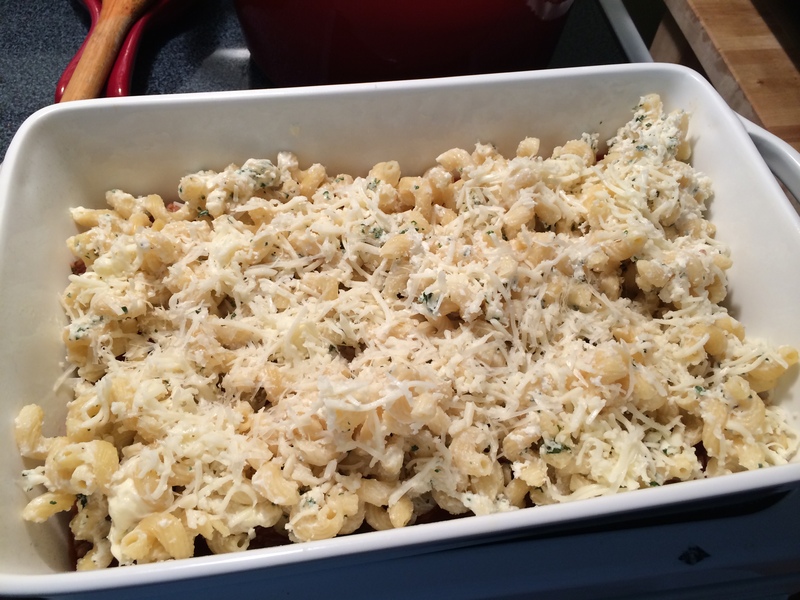 For the top of the dish, sprinkle the remaining Mozzarella and Parmigiano-Reggiano cheeses evenly all over the top. *Dot the top of the dish with small pieces of unsalted butter. Tip: Before covering the dish, spray the underside of the foil with non-stick cooking spray so it will release without taking your cheese with it. Bake at 350-degrees F. covered for 40 minutes, then uncover and bake for another 10 to 15 minutes. Let rest for 20 minutes before cutting. Serve hot. *Dot: to scatter bits of butter over food. Refer to the picture above.